Winchester Canyon. Quintessential Goleta. At the far west end of Goleta, this is one of the last places that looks like the Goleta of old. Somehow untouched by the all powerful developers, agriculture is still the order of the day and wildlife abounds. So how did this beautiful canyon get the name Winchester? Well, like so many things in Goleta, it’s all because of this guy, Colonel W.W. Hollister. 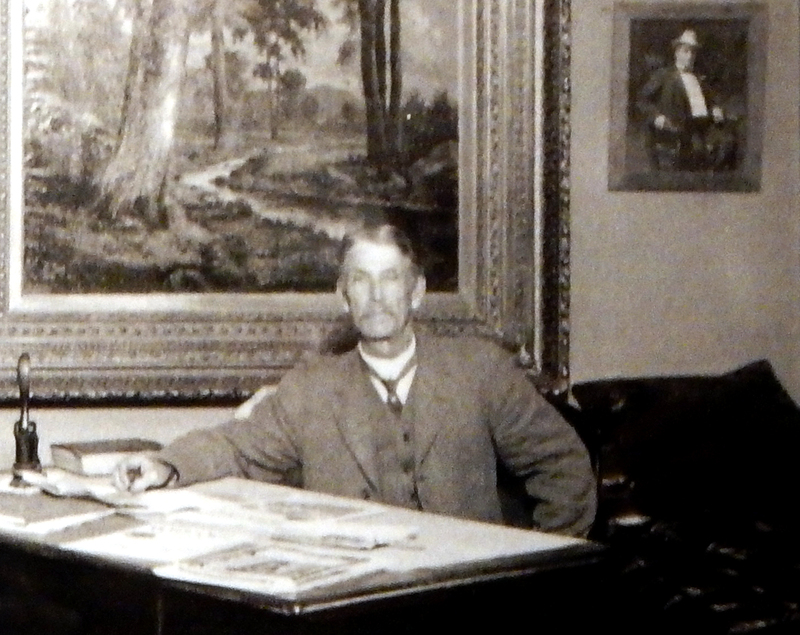 When Hollister made his move down to Goleta, he brought a lot of influential people with him, and one of these people was his personal physician, Dr. Robert Fulton Winchester. Robert Winchester was born in Maine in 1845. At the age of 16 he became the apprentice of a “horse and buggy” doctor. This was how a lot of early physicians got their start in medicine. When his mentor got called into service for the Union Army in the Civil War, Winchester volunteered and went with him. He worked on the battlefields and in tent hospitals at his mentor’s side, a true trial by fire. Even under the most brutal and primitive conditions, young Winchester displayed a real knack for surgery, and promised to be an excellent physician. After the war, he went to Bowdoin College in Brunswick, Maine and graduated in 1867. The very next year, he moved to San Francisco to practice medicine in the wild and exciting west. When he opened his practice out west, things were just settling down after the Gold Rush days. Not long after his arrival, a smallpox epidemic broke out in nearby San Juan Bautista and he volunteered his services there. At one point, he was in charge of 1,500 patients. He was so successful there, they made him Monterey county physician. This was when he first met Colonel Hollister, who was very impressed with the young physician. Colonel Hollister was in the process of moving south to Goleta around 1870 and he was determined to make Winchester his personal physician. To entice the Doctor to join him, he helped him buy 1,000 acres of choice Goleta real estate from the Den Family. It was the canyon just west of Ellwood Cooper’s ranch and to this day, it’s still called the Winchester Canyon. The good doctor took the bait, and agreed to move south with Colonel Hollister in 1872 as his personal physician. The ranch life, however, was not Dr. Winchester’s style. He soon moved into Jose Lobero’s adobe in town and made that his office and home. (Lobero was good friends with Hollister, and the Colonel had also lived there while he built his precious Glen Annie ranch.) In 1872, Stearns Wharf opened and created an economic boom, bringing a wave of new people into the Santa Barbara area. This was the same year Winchester started his practice in town. Good timing… Dr. Brinkerhoff was well established as the main physician in town, in fact, he was pretty much the only physician in town! So young Dr. Winchester soon had more than enough patients to keep him busy, in addition to tending to the Hollister family. Dr. Winchester sold his ranch in Goleta to Colonel Hollister at a profit and bought this house in Santa Barbara. He got married to Miss Carrie Snow on Christmas Day, 1876. In 1877, he had a niece born, and to mark the event, he planted a small Norfolk Island Star Pine on the corner in front of his house. It would be quite a memorial indeed… In 1912, Winchester’s former home was demolished to make way for the beautiful new YMCA building at Carrillo and Chapala. Fortunately, they chose not to remove his pine tree, and it grew to new heights. By 1920, the city began putting lights on it for Christmas and it became the Tree Of Light. Guess what, it’s still there! And it’s designated as a city landmark. At the corner of Chapala and Carrillo streets, Dr. Winchester’s tree still grows proudly, and still gets decorated every year. All in memory of the birth of his niece, although the plaque says it was planted for his daughter…. In 1885, Winchester’s most powerful patient, Colonel Hollister, accidentally ate strychnine that was used to poison gophers at his ranch. Dr. Winchester was able to save his life, but afterward Hollister’s health continued to decline, due to the stress of a prolonged legal battle. The following year, the man that brought Winchester to Goleta passed away. In 1896, Dr. Winchester leased offices at the brand new Fithian Building, on the corner of State and Ortega. A prestigious location, it was the finest new “skyscraper” in town. In his over 20 years in Santa Barbara, he had served as County Coroner, County Doctor and city health officer. His marriage, unfortunately, had only lasted a few short years, but everything else in Santa Barbara was going well. Dr. Winchester thought his war surgery days were long over, but in 1898 Colonel Hollister’s widow Annie had him rushed out to an army hospital in Virginia. Her youngest son, Stanley Hollister, was shot twice while fighting alongside Teddy Roosevelt in the Spanish-American war. Winchester saved Stanley from his gunshot wounds, but while he was healing he died from typhoid fever. The young body was returned to Goleta and buried beside his father. Above is the last photo of Stanley in his hospital bed, and Dr. Winchester seated at bedside. In 1918, a mysterious illness swept through Santa Barbara. Dr. Winchester was city health officer at the time and people were dying at an alarming rate. One local doctor thought it was paratyphoid, but Winchester was not convinced. When the death toll hit 25 people in one week, citizens led by Pearl Chase insisted Winchester bring in an expert from the State Health Department. This offended the good doctor, and he assured the group he could handle the situation, but the death toll continued to climb… Miss Pearl Chase was not content with Dr. Winchester’s refusal to call for expert help, so she staged a sit-down strike in the doctor’s office, insisting he immediately send a telegram to Sacramento for help. She suspected Dr. Winchester had become a morphine addict, a common problem for doctors of that era, and that sitting in his office would deprive him of his much needed fix. For whatever reason, she was right, and the telegram was sent. When the expert from Sacramento arrived, he quickly traced it to a Salmonella bacteria in contaminated city wells. The problem was addressed and the epidemic was quickly ended. Doctors in these days often worked for free. Not intentionally, but people very often just didn’t have the money to pay them. Winchester’s focus was on helping the sick and needy. He was noted for his energy and intelligence, and his fee was his last consideration. He was an active member of the Santa Barbara community, active in both the Masons and the Odd Fellows. He was also one of the founders of the Odd Fellows Library, which later became the first city library. Winchester had lived in several homes around town, but when he retired, he moved to 412 West Montecito Street with his sister, Charlotte Bagg. The house still exists and is a historic landmark called the Trussell-Winchester Adobe. It is maintained as a public museum and tours are available. Doctor Robert Winchester officially retired in 1925, but he continued to treat folks informally for the rest of his life. He was so respected, old patients continued to come to him for medical advice until he himself became too sick to help them. After a long illness, Doctor Robert Winchester passed away at home in 1932 and was buried at the Santa Barbara cemetery. More than just a doctor, he was a friend, counselor and medical advisor to hundreds of his fellow citizens. Winchester was one of the last of the “old time” family doctors that left his imprint on the lives of many. Truly a lifelong public servant. Today, Dr. Winchester’s name is memorialized in the canyon he briefly owned, but chose not to live in.